I just noticed that there's a new round of ABC Wednesdays so I thought I'd play along too. I went through some of my old photos, looking for anything labeled with A - so here are a collection of pictures involved with A somehow. 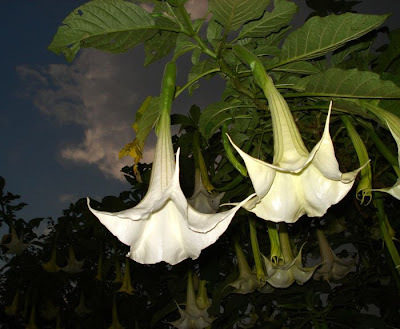 Angel Trumpets - these plants with their thick sweet smell grow all over the dusty poor soil of Xieng Khouang. But people like the white flowers, so they plant them for decoration. I'm not real partial to them, since I know how poisonous they are so I got my landlord to tear out most of them. The dramatic lighting of a storm moving in at sunset does make the flowers look pretty wild. 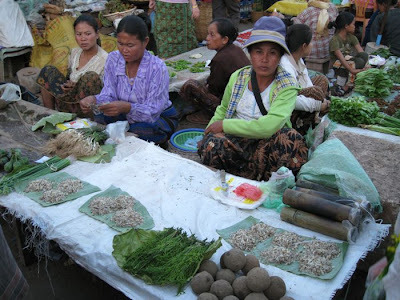 Ants' eggs for sale. During the war years, people ate what they could find - in particular insects and the parts of animals that Americans and Europeans wouldn't eat. Even now, though there is a greater variety of food available, people still eat these alternative forest products. The eggs of red fire ants are very delicious - in the picture, they are the white things, looking like rice, spread out on the banana leaves on the table. This is also my food entry for NaBloPoMo. Artist at work. This man has developed a new angle on making roti, which are flat breads cooked on a hot grill and coated with plastic-like condensed milk. 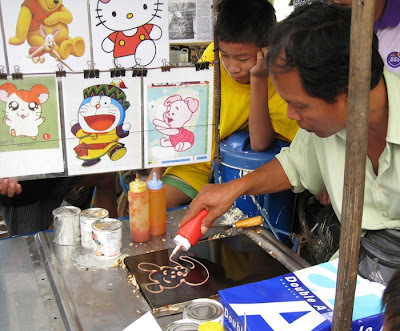 He has a variety of patterns that he can draw with colored dough, then he flattens the usual roti dough over the pattern. He had a line of children around him during the whole time of the boat-racing festival in my village. Both good skills and good marketing. Angry red planet. 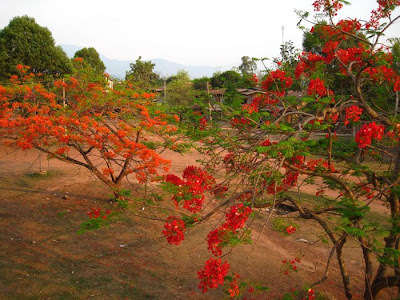 The sun was setting, the flame trees were flaming and the red laterite dust seemed to glow. It reminded me of this film that I had seen as a kid - "The Angry Red Planet," about an expedition to Mars (I stayed overnight at a friend's house and his mom dropped us off at the theater; the first movie I had seen without an adult present). When the astronauts went outside their space ship, everything in the film was red. I also remember that they showed the surface of Mars as being covered with water, with a spectacular crystal city on the horizon. When they tried to go over there, this big fish monster chased them back - but one of the characters got bitten and they blasted off before the fish monster could get them. They all knew he was going to change into a fish monster. Anyway, the following day, it rained when my mother came to pick me up and I freaked out - my six year old brain knew that a fish monster was lurking behind each corner. And my friend got in trouble for both choosing this film - and also sneaking to buy a bar of Bonomo's Turkish Taffy. His mother had told him not to buy sticky candy because of his newly applied braces on his teeth.